March 30th, 2017—Indianapolis–CNG Source announced the launch of a new line of equipment for private stations branded Fuel Ranger Pro. This practical and powerful solution simplifies most of the complexity and cost associated with compressing natural gas for its use as a fuel, facilitating immediate CNG infrastructure deployment for those small and mid sized companies and fleet in need of a private fueling station. Fuel Ranger Pro is the latest development made by CNG Source and it is set to further evolve the NGV market. CNG Source’s state-of-the-art equipment is the culmination of many years of work, data gathering and user experience analysis. The Fuel Ranger Pro completes CNG Source’s portfolio of compressed natural gas equipment and solutions for the natural gas vehicles segment. The company’s new family of product ranges from an output of 10 gallons per hour for the smallest, up to 48 gallons per hour for largest with the possibility of doubling these figures with the duplex units. The Fuel Ranger Pro is available to meet initial orders in the United States and Mexico. The line will later be offered worldwide through distributors specializing in high quality and low maintenance equipment for CNG stations and fleets. 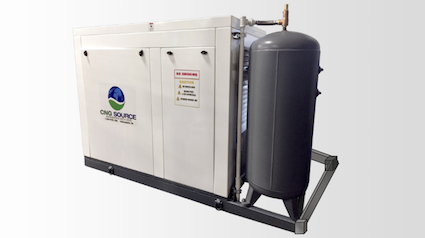 About CNG Source: A veteran company located in Indianapolis with offices in Houston and Mexico, CNG Source develops and manufactures game-changing CNG equipment, as well as provides custom engineered solutions for natural gas fueling station builders and commercial fleets. Offerings range from time-fill posts and CNG dispensers to complete fueling solutions. CNG Source also leads the industry in specialized CNG engineering and R&D services. Turnkey solutions for fleets are purposely designed to evolve and grow along with expanding businesses. CNG Source harnesses decades of experience to ensure future success.